For travelling, different transportations minivans can be really favorable solution. Ecorent offers beneficial regulations that make bus hire a very good option at any time. There is no need for a long time to make the booking accepted and the transports would be waiting at the chosen time and place. The provided service is a high quality and allow enjoy benefits. 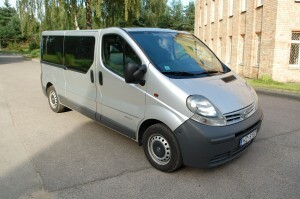 In offer are minibuses with 8-9 seats. They use diesel which reduces fuel consumption this way also reducing the fuel costs. You can choose Mercedes Benz Vito L, Opel Vivaro, Mercedes Benz, WV Caravella . Each of them costs 30 Ls per day and everyone can choose the most appealing one. Release years are 2000-2003 that doesn’t make significant differences in the fuel consumption, thus there are wide range of options, because there is no big difference which particular minibus is chosen. Each of them can be can for different trips and comfortable interior will help to feel good every participant of the drive. Additionally can be rented GPS and other additives if there rises such a need. It is available for relatively small additional price, but it can significantly improve the entire trip for the driver as well as others, because there won’t be a need to worry whether you are driving on the right road. Using a roof rack can be decreased the problem with property if them are them are too much, but everyone wants to take with them especially as much they have taken. Thus, it can help to avoid the overload in interior of the car and easier to find the exactly the desired at any time. every minibus keeps up with other safety standards; therefore, there is no need to worry about the unwanted incidents. Each will feel safe regardless of whether it is at the wheel or in one of the adjacent seats. Bus hire with Ecorent will always be qualitative and successful. Modern technologies allows you to make reservation more faster. It will also help everything to be simple and understandable. There will be signed the lease agreement, which will include the certain rule points, thus helping to avoid unwanted conflicts. In case of uncertainty it is possible to simply send additional e-mail or simply call. Everyone can find a solution if they want and are determined to enjoy the benefits of a lease vehicle. They won’t break on the road and won’t need a significant additional maintenance as it is in good-enough technical condition. Remembering the normal ground rules, it is possible safe and enjoyable way that is regardless of the weather conditions, the route length and other factors.